Review: I rue saying that ClariS’ “irony” is an aptly named song, since there’s not much to it that I’d call ironic. Sure, irony is rife throughout the anime it opens, Ore no Imouto, which makes it an interesting novelty, since the Japanese don’t typically have what I’d consider an ironic sense of humour. The song itself is standard J-pop and there’s no intention to redefine the genre at all. And that’s fine. Most of the time, all that matters for a J-pop anime theme song is that it’s catchy, and this is catchy. Invoking Ore no Imouto’s tsundere imouto main character, Kirino, “irony” succeeds as an image song. She’s hip, popular, cute and passionately energetic, and comes with both a sharp edge and a load of teenage insecurities, and a lot of the same things can also be said about the song. ClariS, a duo who, as far as I can tell, are making their debut with this release, perform fairly well, and while most of it is sung within comfortable bounds, they occasionally have to extend themselves, especially in the moments just before the chorus. Yes, it’s not hard to tell that they’re guided by autotune (the bridge in particular features way too much jarring mixing of voices), but again, I’m fine with letting it slide because it’s a catchy song. There’s a softer version of the chorus that comes immediately after before we hit the most intense rendition of the chorus. Yeah, even the structure is safe pop. But it does it with a fun energy, and that’s all that really matters. “Kokoro no Inryouko” is the song that wants you to dance, and being an introverted anime nerd, are you really one to disappoint it? Take out the Japanese lyrics, and this is the sort of song that wouldn’t be out of place at a high school social. It too is catchy, filled with beats and clapping and a flat bassline that, if my ear is musically sufficient enough to discern, consists of all of three notes. But it’s a song that’s upbeat and bright. “Neo Moon” isn’t though, which is why it’s the song that sticks out the most, and not in a good way. It starts out a bit more subdued, almost as if it’s time to slow the dance down, but that quickly stops once the song hits its stride, and breaks things up with an urgent beat that wouldn’t be out of place as an insert song for a ‘90s robot anime. Each verse follows a chorus progression which creates an uncomfortable tension, and it never really gives you a place to release that tension. I liked the short piano solo in the middle of the song, but that’s about the only positive thing I might say about it. Guest Contributor & Editor-in-Chief of The Nihon Review. As I understand it, ClariS are two junior high girls who have been posting songs to Nicovideo for the past year or more under the name Alice and Clara. Most of the songs have been anime covers, and the arrangements/technology may or may not have been by them. They supposedly won a contest to provide a theme for this show. I like the OP the same way I like Buono, which is quite a bit, no matter how simple it may be. Hmm…I can understand people finding this catchy, but for an anime that delayed the OP until its second episode, I’d expect more from the song…but it seems this track is played very safe and quite flat, not unlike a song that could be churned out by those TV child actress’ pop debut a la Hannah Montana or Demi Lovato. I suppose this is appropriate for the anime, of which the point is to sell the Kirino character. Regarding the name ‘irony’, my take is that if this is a character image song for Kirino, it’s trying to tell me that Kirino is a very normal girl, who likes stuff like shopping, clothes, talking on the phone with friends, etc. The irony the producers are trying to play at then, is that because Kirino plays visual novels about little sisters, she is not very ‘normal’ after all, whatever that is. 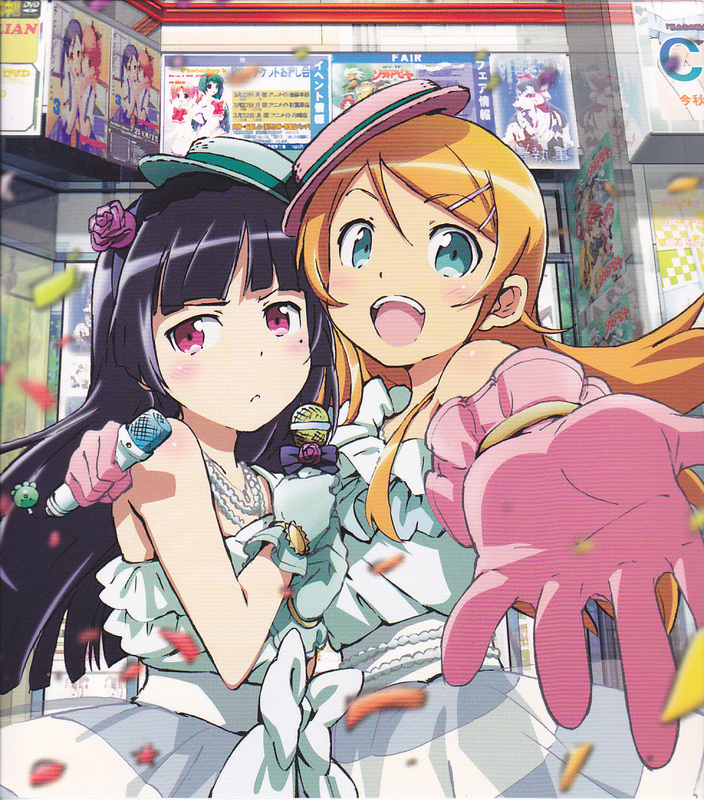 At first, I actually didn’t the the main theme to Oreimo, mainly because at a quick glance it sounds like pretty generic J-pop. Over the past few weeks though, I’ve found myself listening to the song quite a bit more. The few people I know who’ve I introduced the song to found it catchy as well, even though they generally dislike J-pop. I’m interpreting the irony title to this song somewhat differently. In Japan, from my understanding, they think of anime/eroge lovers as unsociable, awkward obsessive nerds. The irony of the whole situation is that those same people that might make such generalizations would see Kirino as an exceptional person, while she is also a closet eroge/anime lover. I haven’t taken a good look at the actual lyrics themselves though, so until I read those, I can’t say as to whether my interpretation is valid or not; Lyrics say a lot about the actual song. I’m not sure how I came across in this review, but the responses here and on Twitter kinda make me think that I came off as more negative than I intended. To clarify, I like “irony”, it’s a nice, simple catchy J-pop song. What I didn’t like was “Neo Moon” but that’s just a B-side, so it doesn’t count that much. As far as being ironic is concerned, I was probably a bit vague about what I was referring to. There are a lot of things about Ore no Imouto that are ironic, Kirino’s character being one of them. There’s also the fact that she likes little sisters without it occurring to her that she is the little sister. But, without the context of Kirino’s character, I wouldn’t say it’s an ironic song. I, too, haven’t bothered to look at the lyrics (I probably ought to have, but lyrics in J-pop songs aren’t quite as important as lyrics in, for example, ballads). If I had, maybe I’d have a different attitude to whether or not the song is ironic, in the same way that Kirino’s character and the show itself is. I don’t think that interpretation is all that different from what I consider ironic about the show. Again, I was probably too vague when I brought it up in the review, but that’s largely what I was talking about when I mentioned her “teenage insecurities”. As for the B-side tracks, I listened to them a bit and they are okay, but not as good as the main track. It seems they haven’t put enough effort in it. Normally, B-Side tracks aren’t that interesting to listen to, but it depends. To a certain extent, ClariS needs some recognition for putting forth a single that’s on par with what more seasoned J-pop artists are putting forth, which, I dunno if that says more about the J-pop industry or the talent that this duo possess. Anyhow, they did play this one pretty safe, which I guess is expected for a debut effort and I do hope they get to the point where they get comfortable enough to be able to try out different styles. Also, I guess anime has tainted my view of Japanese girls. Their voices run on a lower register, which is unlike the high-pitched singing/dialogue we hear in anime. It’s quite commendable what these two girls are doing. I always appreciate young talent who want to give a shot at doing things like this, and I hope that when they do become more comfortable, as zzero mentions, they explore different areas and surprises us all, or even possibly doing something new and amazing. Here’s hoping that something good comes of this. All of you are looking too deep into the term “irony”. The song itself is actually where I fear the anime will ultimately lead. In short, the lyrics talk about the rather cold relationship between Kirino and Kyousuke, and how Kirino doesn’t know how to act now that she actually has a relationship with her brother. It has nothing to do with her Otaku tendencies, it’s a straight up “I now have feelings for you” song. The lyrics are actually a big part of the reason why I dislike the song, as it just seems to be the same thing rehashed into a different tune. That being said, the song also didn’t seem to exude any real emotion, and I believe that if ClariS continues to sing in this style, they’ll end up staying within the mainstream realm of J-Pop. I agree, the song being catchy is what makes me want to listen to it more. “irony” succeeds at doing that even though it sounds like generic j-pop. >> Also, I guess anime has tainted my view of Japanese girls. Their voices run on a lower register, which is unlike the high-pitched singing/dialogue we hear in anime. Which is a plus point in my case. Seeing seiyuu’s perform live makes me squirm. That kind of voice should not fit an adult, or any human being for that matter. >> I agree, the song being catchy is what makes me want to listen to it more. “irony” succeeds at doing that even though it sounds like generic j-pop. In my book, that’s irony right there, since generic j-pop (or otherwise) leaves me cold while this one makes me smile. Yeah, hearing seiyuu sing in character live can make my skin crawl sometimes, especially when they do it poorly or the intonation totally doesn’t fit their adult bodies. I know Aya Hirano is notorious when it comes to this, at least, based on a few Youtubed concerts and her appearance at Anime Expo. I have finally listened to Neo Moon and it wasn’t good… First off it lacked energy and second, it was boring. However, I liked the first two tracks, they are very good.